Situated directly on sandy strip by the Red Sea, the Seagull Beach Resort is a 4-star family-friendly resort, perfect for a fun-filled holiday in sunny Hurghada. 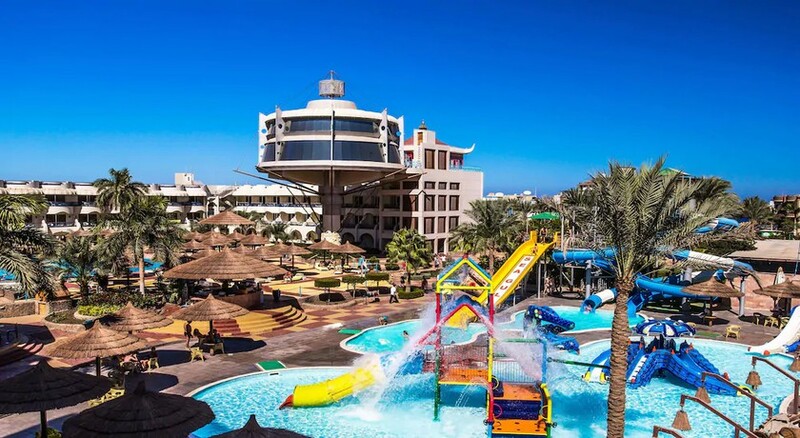 Situated only a few minutes’ drive away from the Hurghada airport, the hotel includes an on-site Aqua Park with 11 water slides and is sure to offer an experience of wellness, sun and relaxation to guests. Offering eight outdoor pools, free Wi-Fi, a discotheque, two cinemas and over a dozen restaurant and bars the hotel promises a memorable stay with comfort to guests amidst warm Egyptian hospitality. The spacious guestrooms furnished in modern style come with air conditioning, satellite TV, mini fridge, direct telephone line, safe deposit box and hair dryer. Seagull Beach Resort is located in the heart of Hurghada by the Red Sea with panoramic views of the Red Sea islands. 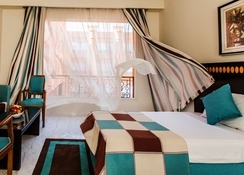 Its Sheraton Road address is just 8km from Hurghada Downtown’s Saqqala Square. 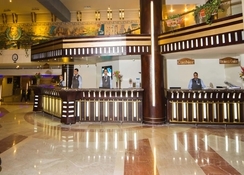 The Hurghada International Airport is just 10km from the property. As many as 731 well-appointed guestrooms are available at Seagull Beach Resort which includes seven suites, eight family deluxe rooms, 84 family rooms, 51 superior rooms, 18 superior front sea view rooms, 16 Junior suites and 540 standard rooms. All the rooms are decorated in posh oriental style and come with air conditioning, satellite TV, mini fridge, a direct telephone line and hair dryer. The hotel offers a clutch of restaurants to cater to the guests’ palate. The Cleopatra Restaurant is a Buffet eatery serving local and international dishes for breakfast, lunch and dinner, Nefertiti Restaurant is another buffet, Fisherman Restaurant offers delicious Seafood for dinner. There is a Chinese Restaurant for lip-smacking Asian cuisine with ambience. It also has a Food Court with Chinese corner, Italian Corner, Oriental corner, Indian corner, in a unique casual ambience. Seagull Beach Resort is located next to a beachfront and has a terrace where guests can soak in the sun and BBQs can be arranged. At an added charge, guests at Royal Lagoons Aqua Park Resort & Spa can retreat into the lovely health spa, which offers massages or access the sauna and steam at extra charges. There is a fitness centre for those who wish to stay active. Tiny tots can have fun at kid’s club, mini zoo or the playground. There’s exciting water-sports, diving and fun water activities at diving centre at beach. There is lively evening entertainment by a multinational animation team and a nightclub too. It has two cinemas showing movies.